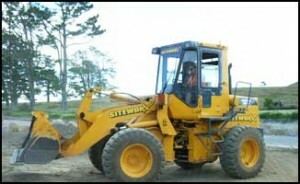 Siteworx can handle most types of earthmoving jobs from the smallest job to the very large. 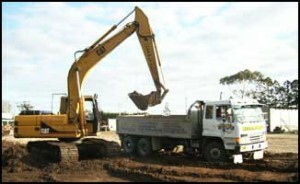 Our equipment consists of 4, 6, 13-ton Caterpillar excavators, 2- and 16 ton Hyundai excavators, Halitrax and Caterpillar skid steer machines, Tip Trucks, Truck and trailers, Rollers, Bulldozer, Loader, Four wheel drive tractors, Laser Levels, Compactors, Concrete Mixers and Cutters plus much more. Our excavators, roller and bulldozer are Caterpillar brand. We find that the reputation that Caterpillar has for being a market leader is what our customers deserve. And breakdowns are something that is to be avoided above all. Our 3-ton excavator is ideal for footings and trenching and sites that are tight (where a bigger machine just can’t go). It is set up with the tilt bucket; stick rake and drilling augers just the same as the bigger gear. Our 8-ton excavator with tilt buckets, post hole borers, stick rake etc. are ideal for house sites, post and pole hole drilling, drainage, heavy lifting i.e. septic tanks and loading out into tip trucks, land shaping etc. Our 13-ton excavator with tilt bucket and thump is for the larger jobs that need rocks, bulk earth moved, shifted and placed etc. We no longer have larger machines, as the size we have is as big as you can go shifting the equipment on our eight wheeler, any larger requires either artic or truck and trailer and pushes establishment cost and time up. We also have found that our new (first in the country) 311F excavator with its modern technology will compete with older much larger machines on a productivity basis without the establishment hassles of the larger machine. The Halitrax is the ideal all weather loading and carting machine with 4 in 1 bucket there is not much it can’t do. Rubber tracks for low ground pressure these won’t ruin the landscape. And our machine is the new prototype model that is only 1200 mm wide so it will go through very narrow access ways and down narrow paths, ideal for landscaping jobs including carting and spreading mulch for example. 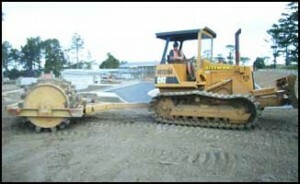 The Grader and rollers work hand in hand on new driveway construction or existing drive or race way maintenance, they are roading construction grade designed for the hard work and they handle the smaller jobs in their stride. The bulldozer is a special low ground pressure model ideal for the wet or soft grounds but with the ability to tow a sheep’s foot compactor should that be what the job requires the best of both worlds. Our tip trucks and trailer handle the removal of spoil and delivery of materials – working in with the excavators.